My daughter was home from college one weekend, and it was breakfast time. Neither one of us were super hungry. We just wanted a little something to go with our coffee. All of a sudden, she hops up off of the couch, and asked if I happened to have any already made pie dough. I did, and she ran straight for the refrigerator. She informed me that this really tastes best with grape jelly. I was shocked. Typically, I’m the only one in my family who will eat grape jelly. She didn’t have to ask about the next two ingredients: eggs and powdered sugar. We always have them on hand. 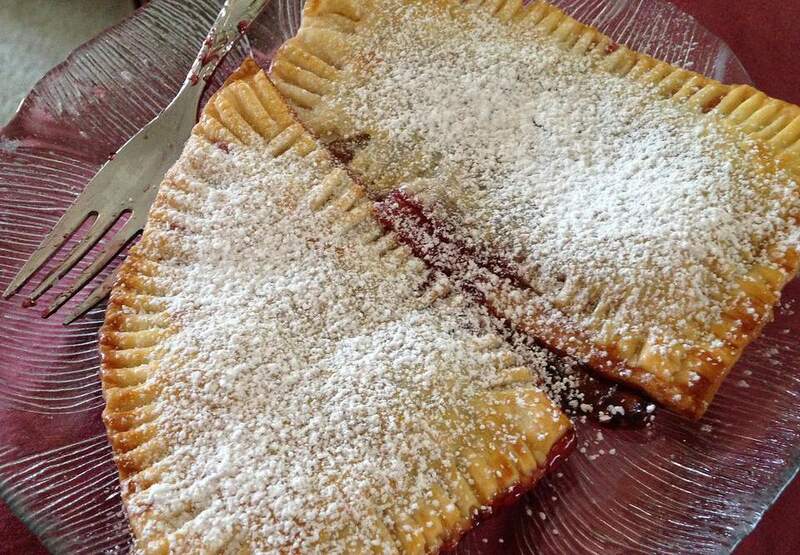 She proceeded to make these homemade pop tarts, and they were very good. If you are someone who prefers to have all of the ingredients made from scratch, those ingredients and directions are included at the bottom of the recipe. Preheat the oven to 425 degrees. Line a cookie sheet with aluminum foil. Lightly grease it. (Using parchment paper or a silpat would work as well.) On a lightly floured surface, unroll the unbaked pie crust. With a sharp knife, cut it into 8 pieces. (You can cut off the rounded edges if you prefer perfect rectangles. We preferred to eat the crust instead of throw it away.) Place 1 rounded tablespoon of jelly in the center of have of the rectangles. Cover the jelly with the last 4 pieces of pastry. Use a fork to crimp the edges by pushing down on them***. Use a pastry brush, and brush the beaten egg on each pastry. Bake the homemade pop tarts for 7-8 minutes. Carefully, remove the tarts from the pan to serving plates, and then enjoy! * Don’t limit yourself to just grape jelly. You could use Strawberry, Lemon Curd or other fruit flavors. I haven’t tried it, but I think a brown sugar, cinnamon mixture would be as good too. In a large bowl with a wire whisk stir together the flour and salt. Put the bowl in the refrigerator. Also place the measured shortening in the refrigerator. Measure out the water into a glass measuring cup. Place it in the refrigerator too. Chill all of these at least an hour. Remove the flour mixture and shortening from the refrigerator. Cut shortening into flour either using a pastry blender or two knives in a scissor fashion. Once the flour/shortening mixture resembles pearls, stir in half of the water with a fork. Continue to add just enough water hold the pastry together into a ball. Flatten ball into 1/2-inch thick round disk. Wrap in plastic and place back in the fridge for 30 minutes. Flour your work surface and rolling pin. Roll out the ball. Rolling from the middle out, roll out into a rectangle approximately 9x5 inches. Follow the above directions for making the pop tarts.